Hello! I am completely new both with origami and this forum. My name is Brooke and I am currently trying to complete a cigarette lighter by Nick Robinson. My intentions are to give it as a gift for Valentine's Day so I am trying to get it completed as soon as possible! 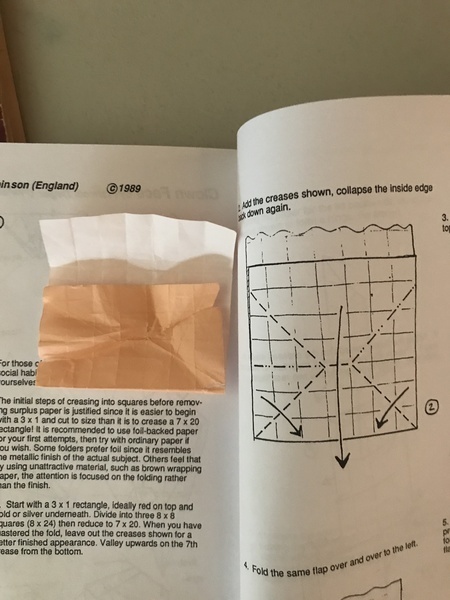 This origami is found in Origami USA Convention 1989, pg. 292. 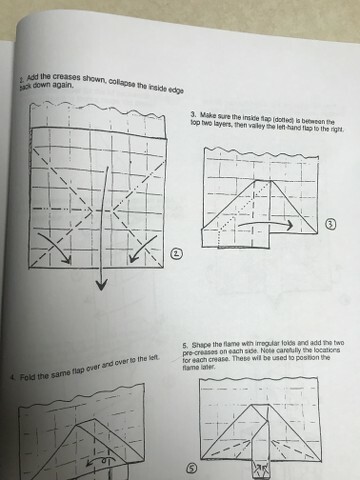 My first question is this: The instructions state to start with a 3x1 rectangle. I currently have 5 7/8 in x 5 7/8 in folding paper. I looked up how to make it into a 3x1 rectangle and believe I did it correctly. However, I feel the paper may be too small. Would it be better to purchase bigger paper? My next question is for step #2 and step #3. I believe I did the creases correctly for step 2 but have no idea how to fold it to make it look like how it looks in step 3! Any help would be much, MUCH appreciated! Without being familiar with the model (and judging based on the diagram fragment in the post), I'd say that, yes, a 5-7/8" square is far too small for a decent sized model. A 3x1 rectangle from that size would be less than 2" wide. I'd recommend buying squares of 10" origami paper at a craft store, since those lend themselves to larger models. As for cutting it into thirds, crease one diagonal and pinch the midpoint of one edge. Join that pinch with the opposite corner via another crease (such that it crosses the diagonal), and that's exactly 1/3. Step 2 appears to be missing a valley fold running vertically upward from the rightmost crease intersection. Thank you so much for the info. I actually ordered 9.75" origami paper. Would that work for this design? And here is the first page with instructions. 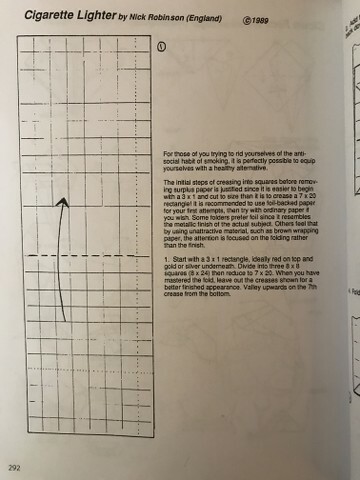 Is how you said to cut the paper the same as what they are talking about here? Also, with step 2 it seems their square is so much closer to being equal on both sides compared to what I keep getting which is way wider than it is long after you fold it up on the 7th crease. The second picture shows what I get compared to what they have after I complete the 1st step. Thank you again your help is SO much appreciated! 9.75" should work, though it will still be a little smaller than you might be used to folding. As far as the shape of the paper, it might help to make sure your creases are even and accurate. Based on your picture, the grid isn't square; that would explain the difference between your paper and the diagram. Are you using a 7x20 strip as specified? Baltorigamist wrote: 9.75" should work, though it will still be a little smaller than you might be used to folding. I believe I was doing something called a bronze rectangle shape instead of just 1/3 of the paper. I went ahead and cut the new paper into thirds. 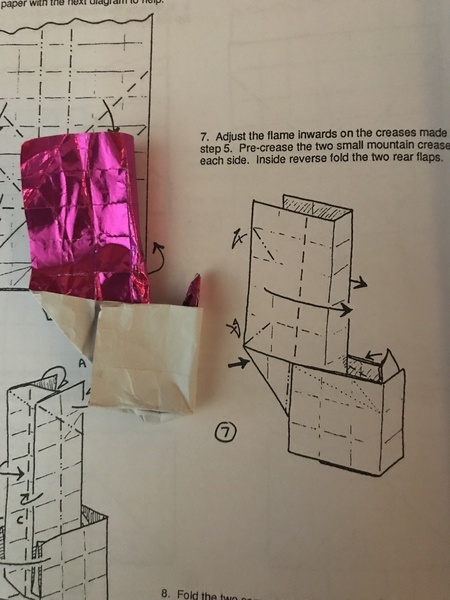 With the mention of the missing valley fold in step 2 I finally made it past the step I believe so thank you for that! Here is where I get a little lost next. 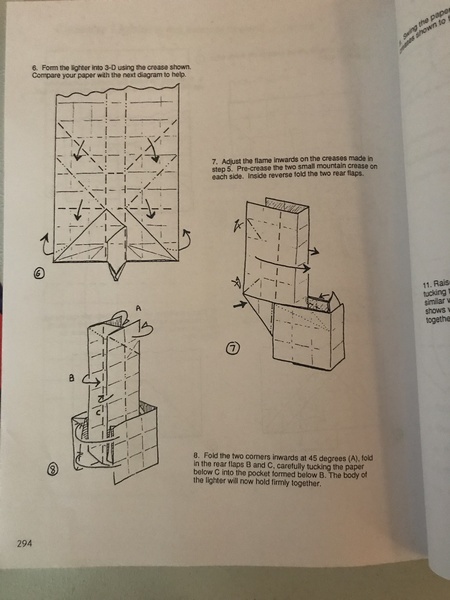 I think I got it to look like it is pictured in step 7 but I'm not sure how to do the inside reverse fold to make it look like step 8. I attached what mine looked like after step 4 and then what mine looked like after step 6. For 7, it looks like you need to pinch where indicated (the mountain creases) and perform two inside-reverse folds. For the latter, the mountain crease running to the edge (when looked at from the left side) will be reversed into a valley; you’ll also make two mountain folds perpendicular to the horizontal edges. 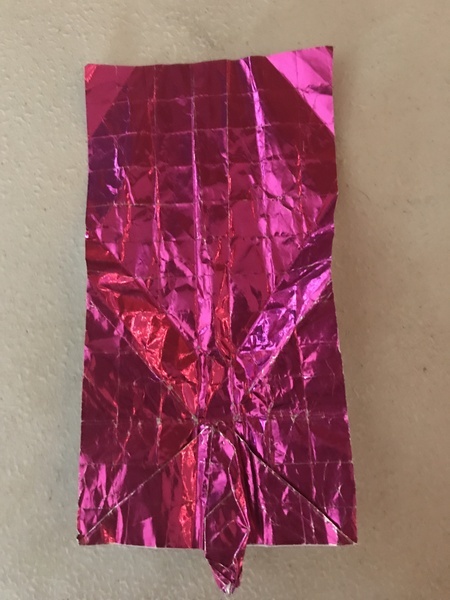 Some more advice: try to fold more cleanly, taking your time and doing your best not to crumple the foil. It takes practice (and foil is far from ideal in most situations), but it’s well worth the extra time. Thank you so, so much! I redid it neatly and can do steps 1-6 perfectly fine now! However, I am still not understanding step 7. Any way you can explain what it is asking any further? I made the 2 small mountain creases on each side (so a total of 4 small mountain creases). I’m then holding where the arrow is and pushing inward in order to make the mountain fold it shows but I can’t wrap my head around the inside reverse fold especially because of the valley folds above it. Thank you for the heads up about linking as well! The arrow is just an indication that you have to reverse fold, not a mark for where to hold the model. The 45deg edge on the bottom (a mountain fold) will be reversed into a valley fold (hence the name of the inside reverse fold). The raw edge on the left of the diagram will go between the two layers on the side of the model. There's a clearer diagram of a reverse fold here.